The four-day annual technical festival ‘Shaastra’, organised by the Indian Institute of Technology-Madras (IIT-M) for the 19th year in a row, got underway on Thursday. 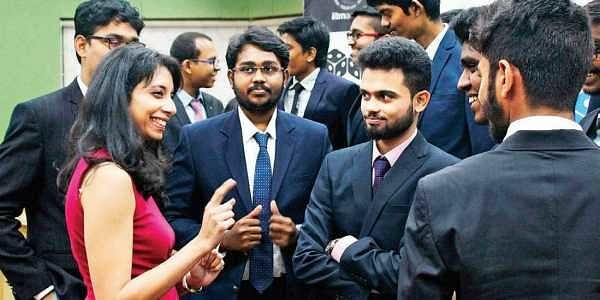 CHENNAI: The four-day annual technical festival ‘Shaastra’, organised by the Indian Institute of Technology-Madras (IIT-M) for the 19th year in a row, got underway on Thursday. With focus on future customer needs, student teams came up with out-of-the-box technological innovations that have potential to change the ways we live. 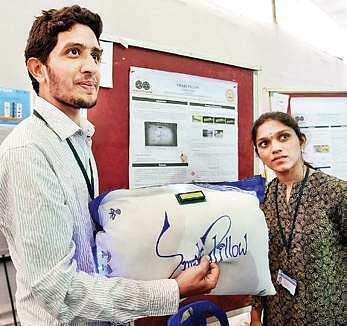 A student team from Velagapudi Ramakrishna Siddhartha Engineering College in Vijayawada in Andhra Pradesh, showcased a low-cost smart pillow that calculates sleep time, stops one from snoring, regulates air-conditioner and plays favourite bedtime riddles. Two third-year students Sushma Koripalli and Yagna Muni developed the pillow with an objective to relieve people from overexposure to radiation emitted by mobile phones. “Our habit of keeping mobile phones beside our bed can harm us a lot. This is because the mobile phones transmit radiation up to 300 GHz that is harmful. Our smart pillow used Bluetooth and Wi-Fi and transmit just 2.4 GHz, which is safer,” the students claimed. They said the product comes with an auto alarm, can monitor and analyse sleep and can be controlled using Bluetooth from any android phone. Muni said it took them just a week’s time to develop the smart pillow and would be handy for hospitals to monitor a patient’s sleep quality and duration. On how it works, the students said it has a simple technology with basic sensors and a real-time clock. “Many features can be added. It costs us `2,800 for developing a prototype and it can be brought down to `1,000 with the use of more compact circuits. An app is also being developed for integration and the sleep data can be viewed in the app,” they said. Another group of students from RVR & JC College of Engineering in Guntur presented a new safety system in cars, which can prevent passengers from suffering major injuries. Four students Harish Chaitanya, S Arvind, Y Surrendra and Hari Sai Chaitanya came up with an idea of providing sliding mechanism to the seats. At the point of collision, seats will be pushed back by the compressed springs, which have been placed in front of the seat and the trunk gets automatically opened using power lift gates so that the passenger will be safe. This in combination with currently available safety systems such as air bags and seat belts will ensure complete safety of passengers. These two technologies attracted a lot of interest at the Research and Innovation Expo among various others. Meanwhile, addressing a press conference, IIT-M Director Bhaskar Ramamurthi said every year ‘Shaastra’ is becoming bigger and better. “This throws up challenges of wildlife conservation and waste management. Students are seized of the matter. The campus will see a lot of activity in the next 15 days as for the first time inter-IIT tech fest is being hosted by IIT-M and that will be soon followed by ‘Saarang’ festival. However, the kind of experience students get in organising such co-curricular activities is unparalleled,” he said. This year, for the first time, India’s biggest Deep Learning Services is being hosted, in association with Amazon Web Services. A total of 25 teams are competing for top five positions under Carbon Zero Challenge, which provides them an opportunity to incubate at IIT-Madras that has a perfect ecosystem for startups. About six months ago, 530 teams had submitted a proof-of-concept solution and these 25 teams were selected to go to the next phase of the event. Around seven teams are from IIT-M, 13 are from other South India colleges and five are early-stage startups. They received `5 lakh each as prototype funding and will be exhibiting the functional prototypes during the grand finale scheduled to be held on February 7-9.